Although Point Cabrillo was surveyed by the U. S. Lighthouse Service in 1873, construction of the Light Station didn’t begin until after the 1906 earthquake. The demand for lumber to rebuild San Francisco meant that maritime commerce on the north coast was at an all time high and a Lighthouse was critical to the safety of the ships and their valuable cargo. Construction of the Light Station began in 1908, and the lens was illuminated for the first time on June 10, 1909, under head keeper Wilhelm Baumgartner. Baumgartner invited the neighbors and residents of Pine Grove to attend the midnight ceremony. Built and managed by the US. Lighthouse Service under the Department of Commerce the original Point Cabrillo Light Station included the buildings still standing today (with the exception of the current pump house and water tank). These include the three keeper’s residences, the coal buildings (now garages), the carpentry shop and smithy, and the oil house. Several other structures – two water towers, a barn, and the original pump house have since been removed. The barn, which was located to the south of the residences at the end of a side road, was used as a U. S. Air Force radio monitor’s training facility after WW II. It was burned by the Volunteer Fire Dept. as an exercise in the late 1980s. The U. S. Lighthouse Service was officially absorbed into the Coast Guard in 1939. Bill Owens/ who also served at the Point Arena Lighthouse, was the last civilian lighthouse keeper at Point Cabrillo. He retired in 1963. Coast Guard officers and their families continued to live in the keepers houses until the Conservancy took possession in 1992. The light tower houses a third order, British-built Fresnel lens by Chance Bros., with a range of 13-15 miles. The lens was originally powered by a kerosene oil lamp. There are only 2 other British-built lenses in operation in the U.S. today: A 1st Order lens at Heceta Head Lighthouse in Oregon, and a 2nd Order range light (”fixed”) at Battery Point, Staten Island, New York. The lens rotated at a fixed speed and produced a flash at ten second intervals. The rotation pattern of a lighthouse is printed on the nautical chart, it’s the lighthouse “signature” and must not vary. The main part of the structure is called the “fog signal building”. It housed two pairs of engines and compressors that created a siren using compressed air. A head keeper and two assistants rotated shifts to keep the light burning and the compressors powered. They also cleaned and painted and kept the lens and station machinery in working order. The lighthouse service gave them each a house for their family and a yearly salary of $450-$600/ and they raised crops and livestock. In 1973, the Fresnel lens was disengaged, and an aero-marine type rotating beacon was mounted on the roof of the fog signal building. The original lens remained in the lantern room but the clockworks and fog signal machinery were removed. In 1996 the Conservancy was awarded a federal grant through the ISTEA program (Intermodal Surface Transportation Enhancement Activities) for the restoration of the lantern room and the creation of public service facilities at Point Cabrillo (parking and restrooms). Work on the project began in August of 1998 when the Fresnel lens was dismantled and removed from the lantern room. 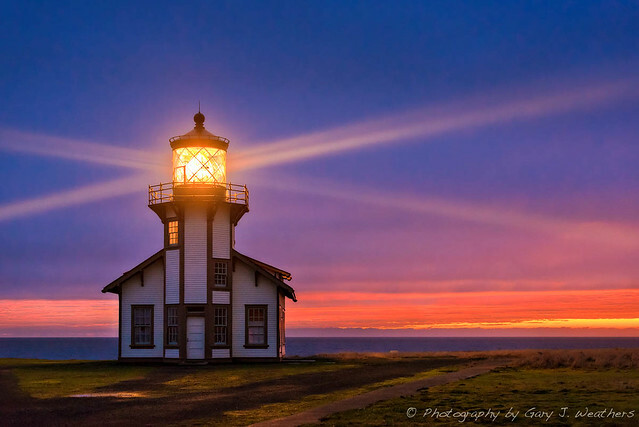 The lantern room restoration was completed in April 1999 and the Fresnel lens was refurbished and reinstated as the active aid in time for Point Cabrillo’s 90th Anniversary. The restoration of the Fresnel lens was funded by the NCIA with assistance from the Coast Guard. The restoration of the fog signal building was funded by the NCIA and the Coastal Conservancy. The restoration of the rest of the lighthouse tower and fog signal building was completed in August of 2001 with funds provided by the Coastal Conservancy and the NCIA. The first Point Arena Lighthouse was constructed in 1870. Its brick and mortar tower featured ornate iron balcony supports and a large Keeper residence with enough space to house several families. In April of 1906, a devastating earthquake struck the tower. Damage from the trembler occurred all along the San Andreas Fault, which runs very close to Point Arena. In the town itself, many buildings were reduced to rubble, and at the Light Station, the Keeper’s residence and Lighthouse were damaged so severely that they were rendered condemned, and ultimately torn down. The United States Lighthouse Service contracted with a San Francisco based company to build a new lighthouse here to withstand any future earthquakes. The company built factory smokestacks, which accounts for the final design for the new Point Arena Lighthouse. The new design featured steel reinforcement rods encased in concrete, and was the first lighthouse to be built in this manner. The new Lighthouse began operation in 1908, nearly 18 months after the quake. It stands 115 feet tall, and features a 1st Order Fresnel Lens, over six feet in diameter and weighing more than six tons. The lens is made up of 666 hand-ground glass prisms all focused toward three sets of double bulls eyes. It is these bulls eyes that gave the Point Arena Lighthouse its unique “light signature” of two flashes every six seconds. This incredible optic, that holds an appraised value of over $3.5 million, is set in solid brass framework, built in France. Prior to the introduction of electricity, the lens was rotated by a clockwork mechanism. The Keepers, or “wickies” as they were called, had to hand crank a 160 pound weight up the center shaft of the lighthouse every 75 minutes to keep the lens turning. Light was produced by a “Funks” hydraulic oil lamp, that needed to be refueled every four hours, and whose wicks would have to be trimmed regularly. Later, two 1,000 watt electric lamps were installed to replace the oil lamp, and a 1/8 horsepower electric motor was installed to replace the clockworks. In 1978, the fog signal at the station was silenced, and a bell buoy was placed nearby. June of 1977 brought the installation of an automated aircraft-type beacon on the balcony tower, and the historic 1st Order Fresnel Lens was discontinued. The 400 pound aircraft beacon has recently been replaced by a 40 pound modern rotating light that incorporates the Fresnel principles for the efficient projection of light. There is a battery powered emergency system installed as a back-up in the event of a power failure. In addition, a radio beacon, with a 50 mile signal that originates from the station, also assists mariners. The original oil lamp was visible for approximately 18 miles, the 1st Order Fresnel Lens for 20 miles and the current modern rotating light can be seen for 16 miles. In 1984, a nonprofit organization called the Point Arena Lighthouse Keepers acquired the light station as part of a 25 year land lease from the Coast Guard and the Department of Transportation. In November of 2000, the nonprofit group became the official owners of the property due to their diligent historic preservation and educational efforts. Daily visitation, gift store sales, memberships and the rental of the historic Keeper’s homes on the property as vacation houses, all provide desperately needed income for ongoing preservation, facility upgrades and educational endeavors. This entry was posted in Mendocino Attractions and tagged California, mendocino coast, mendocino lighthouses.